zk-SNARKs, Zk-STARKs and BulletProofs are three major zero knowledge proofs to provide privacy for the blockchain technology. (1) Bulletproofs and Zk-STARKs require no trusted setup. Unlike zk-SNARKs that requires a trusted setup that creates an uncomfortable situation for it. (2) Zcash using zk-SNARKs can hide amount address along with sender and recipient. It is not yet clear to me if it is possible to hide sender and recipient by Bulletproofs and Zk-STARKs. 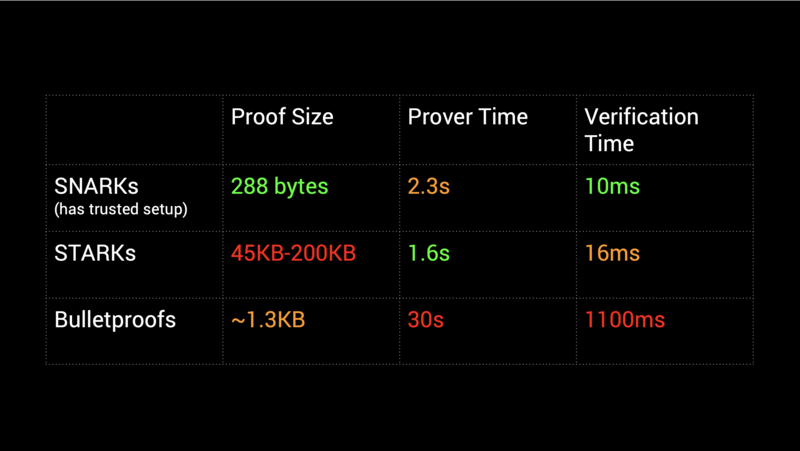 (3) Apparently, Zk-STARKs is faster than zk-SNARKs is faster than Bulletproofs. (4) Bulletproofs is shorter than zk-SNARKs and Zk-STARKs. In general, what are the main differences (advantages and disadvantages) between these 3 main zero knowledge proofs techniques ? 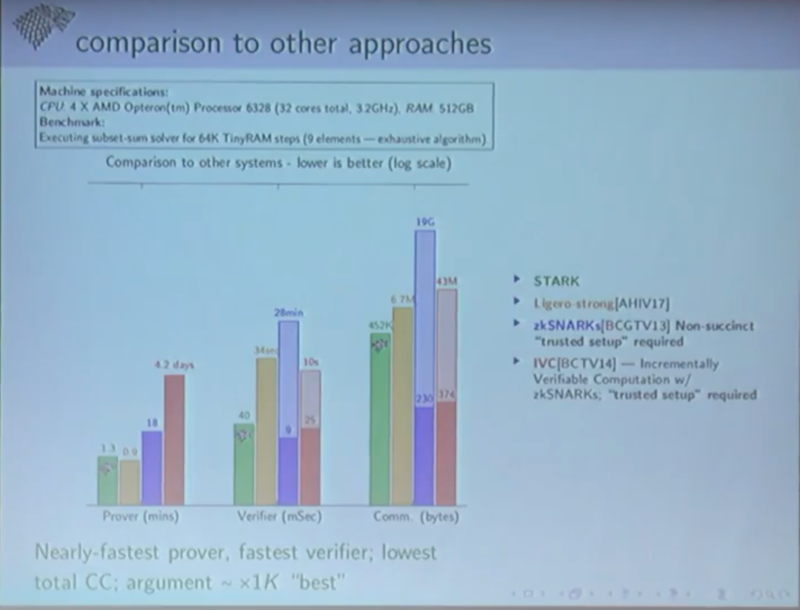 STARKs are only faster than SNARKs at the prover level (1.6s vs 2.3s), while for verifiers the protocol is slightly slower (16ms vs 10ms). What are the main differences (advantages and disadvantages)? 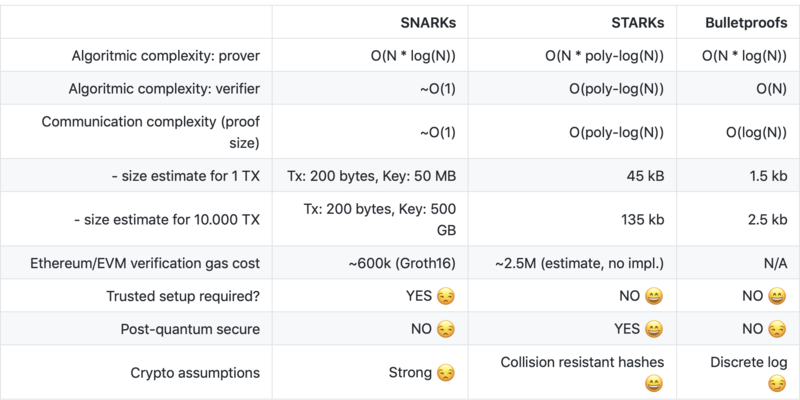 Starks are almost better than Snarks all around: they require weaker crypto assumptions, don't require a trusted setup and are post-quantum resistant. But they have a major drawback, as in the proof is huge. For certain applications, like the one I have to work, that is simply not feasible. We had to choose between a Snark proof in the order of hundreds of bytes and a STARK proof in the hundreds of kilobytes. That single factor was a killer for us. The time to verify is also remarkably larger in Starks than Snarks. In the former, it grows in time O(poly log n), whereas for Snarks it is linear in the input size, which is just a small constant, especially in complex circuits. Remember that n here is the number of gates. For example, take a circuit that proves you know the pre-image of a certain hash value. The input will be the size of that input, which is 32 bytes if you're using SHA256. For this function, though, the number of gates will be in the tens of thousands, and you can see how the verification time for the SNARK is negligible in comparison. The numbers in the tables above are very misleading. They don't tell you what sort of circuit you have, and how large n is. Depending on how complex your circuit is, they may vary wildly. I prefer to use asymptotic notation, and there is a good table for that in this paper (page 3). 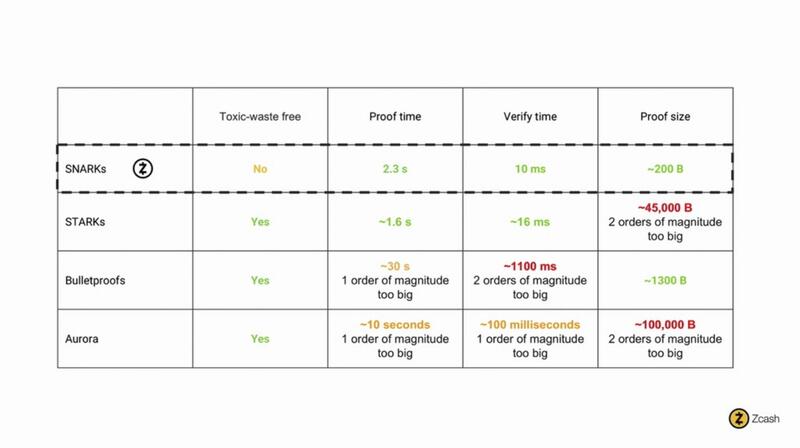 AFAIK Bulletproofs are shorter but to verify them takes way longer then Starks thus making it non scalable for blockchain tx obscuring. Not the answer you're looking for? Browse other questions tagged privacy zksnark zero-knowledge or ask your own question. What data will zk-SNARKs protect?